Note: This guide originally appeared on UpOut.com. That site is no longer making new content updates so we’ll be making updates here. 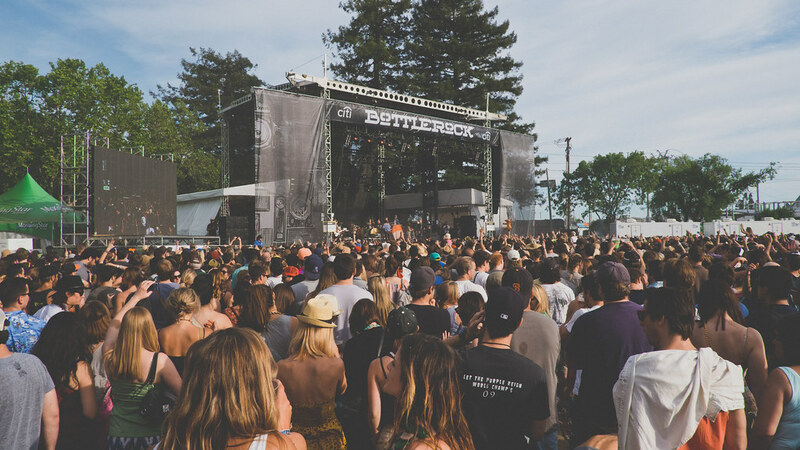 Last update January 7, 2019 to include new information on BottleRock. Burger Boogaloo 2019 Dates Pending Mosswood Park Oakland, Calif. 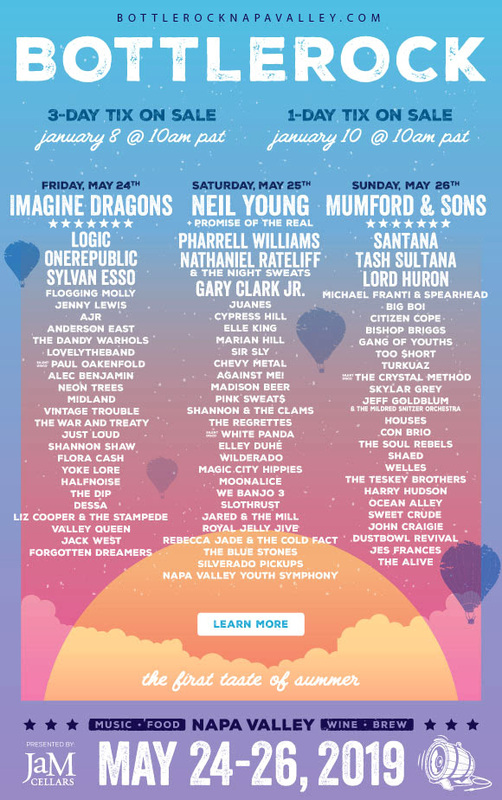 Lightning in a Bottle May 23-28, 2018 Bradley, Calif.
California Roots Festival May 25-27, 2018 Monterey, Calif.
Good news! 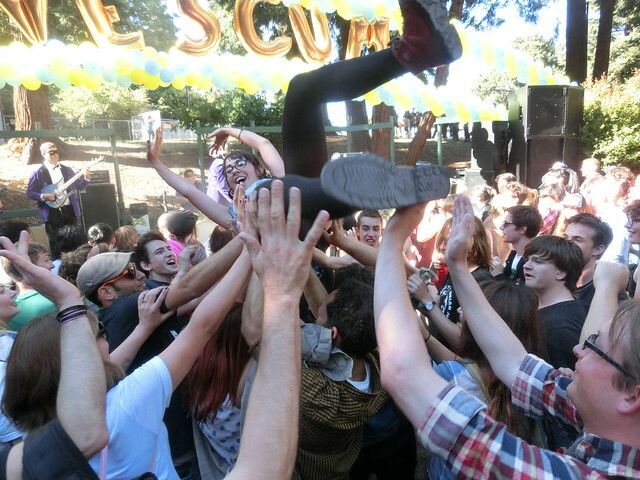 We now have an Insider’s Guide to Noise Pop Music and Arts Festival. Every year, Noise Pop kicks off the national 2019 festival season with a rolling out of artists in three phases. As of today, November 28, they’ve rolled out two of those three phases and this year is looking to be legendary. We’ll see classic indie rockers like Bob Mould and Teenage Fanclub, best album of 2018 contenders like Daughters and Hilary Woods, and rising names like Katzù Oso and Sunsleeper. Badges are on sale here with individual tickets in many cases on already available at venue websites. Happy hunting! 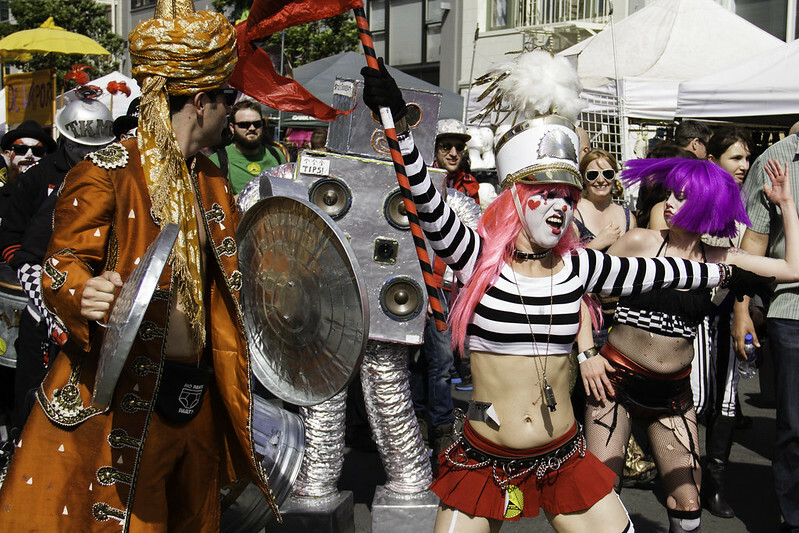 San Francisco loves an excuse to put on a costume and How Weird Street Faire delivers. How Weird returns to the intersection of Howard and 2nd streets with a theme of “The Disco Ball Inferno.” How Weird is the longest running EDM festival in the country. In addition to music attendees hear from speakers, shop for arts and crafts, or just people watch. There are many reasons to be excited about the second Colossal Clusterfest. On one hand, you have the comedians like John Stewart and Amy Schumar who are the main focus of the event. On the other hand, we have the music acts like Reggie Watts or Salt-n-Pepa. Of course, we have the combination of comedy and music that is The Lonely Island. And then we have our extra special third hand which sees City Center Plaza turn into a bizarro land theme park. This year we’ll be immersed in the worlds of The Daily Show‘s Donald Trump’s Presidential Twitter Library, It’s Always Sunny in Philadelphia, and South Park‘s County Fair. Burger Boogaloo is hosted by the legendary filmmaker John Waters in Oakland’s Mosswood Park. What started off as a small punk rock festival has been getting bigger and louder every year. This year the stage will impressively host Devo, The Damned, Quintron and Miss Pussycat, Hunk + His Punk, and others. 2018’s headliners are Florence + the Machine, Janet Jackson, and The Weekend, but the real story might be the impressive undercard. 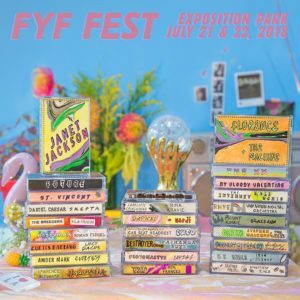 Some of the highlights include Broken Social Scene, Lizzo, Huey Lewis and the News (don’t @ me), Perfume Genius, Chromeo, and Carly Rae Jepsen. It’ll be interesting to see how the day-to-day lineups shakeout. Update April 12, 2018: Tragically, Huey Lewis and the News is no longer performing. More info here. 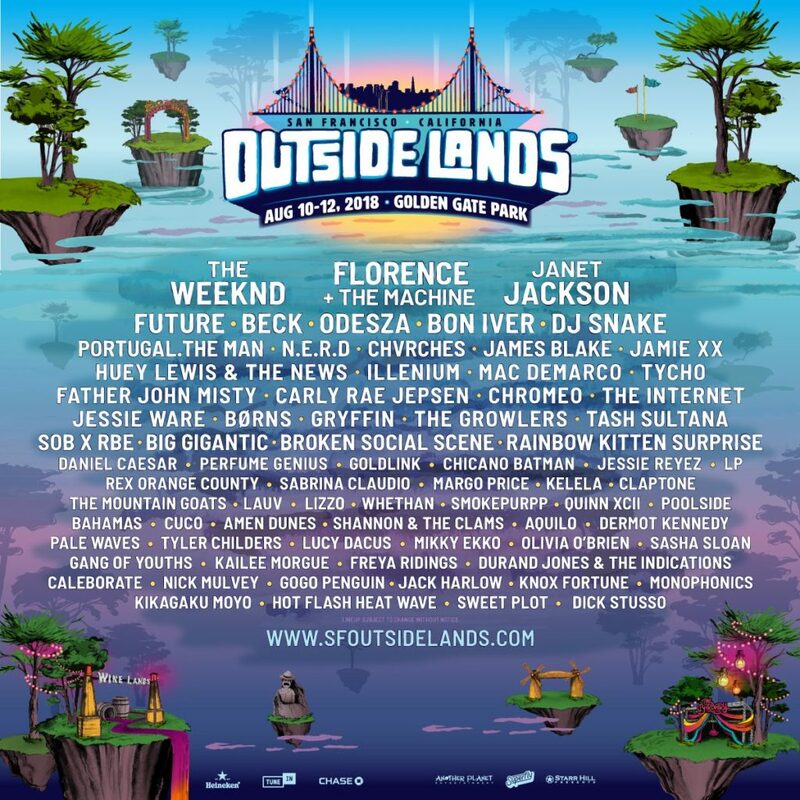 Update May 11, 2018: Outside Lands adds Janelle Monáe, Billie Eilish, Saba and Hobo Johnson. More info here. 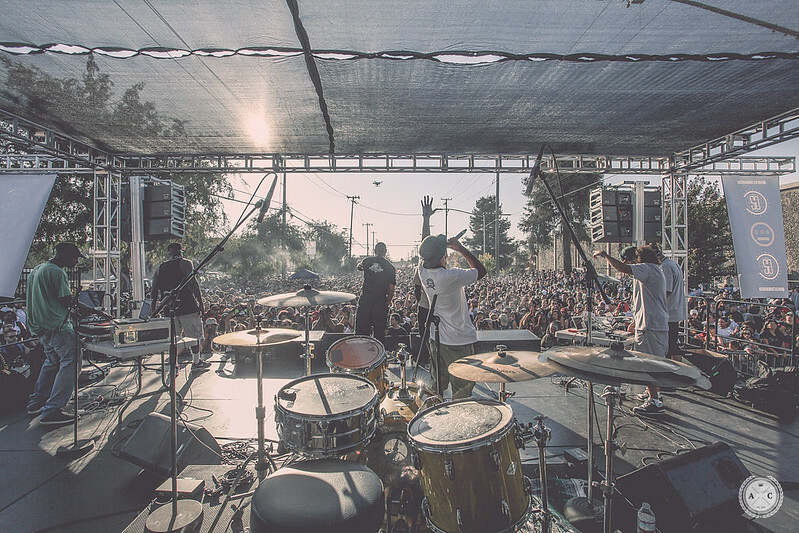 Hiero Day is an Oakland music festival curated by the members of underground hip-hop collective Hieroglyphics. 2016 saw dozens of performers including World Famous Beat Nuts, Dilated Peoples, Juvenile, Lyrics Born, Murs, Too $hort, and Rocky Rivera. The 2018 hasn’t been announced yet, but the website says this will be the biggest Hiero Day yet. 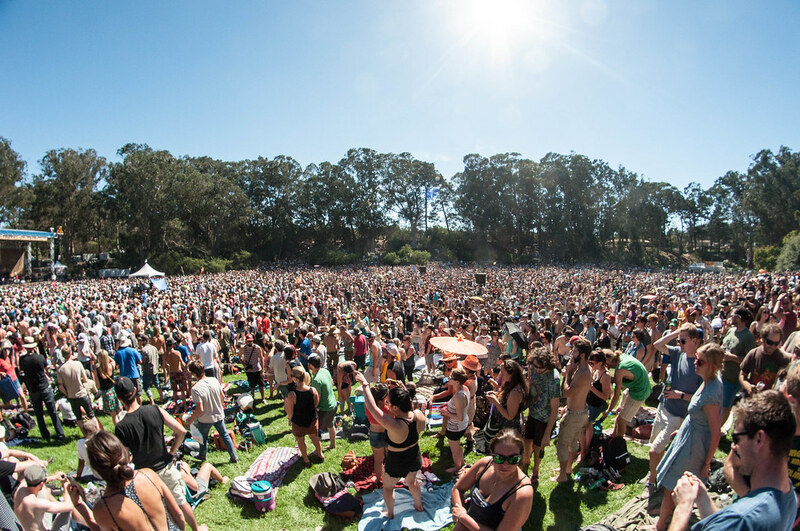 Hardly Strictly’s schedule likely won’t be announced for a few more months. 2016 performers included a whole lot of bluegrass plus performers like Mavis Staples, Conor Oberst, and Shannon and the Clams. 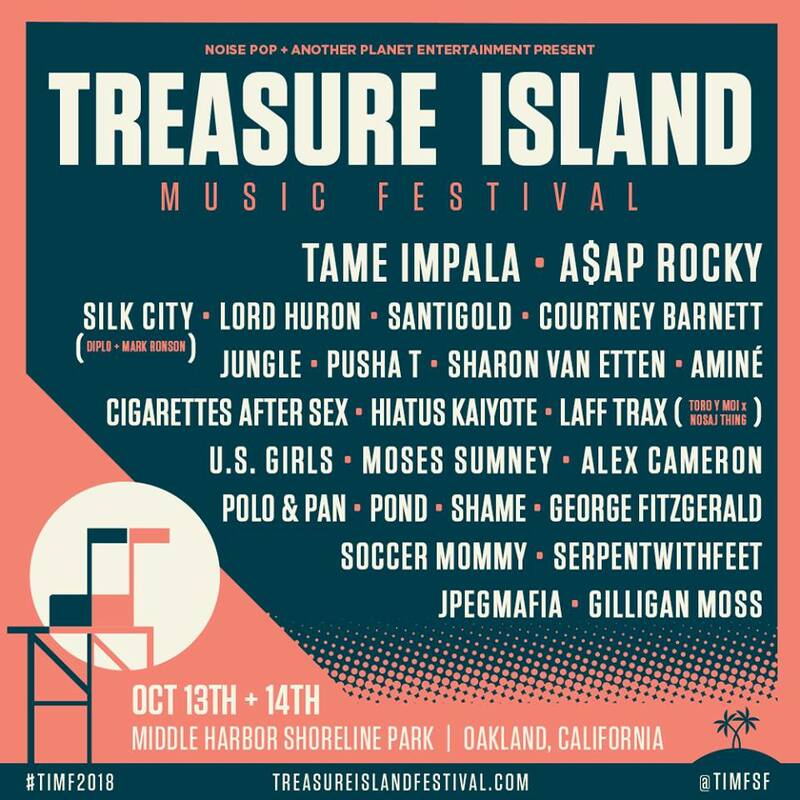 Treasure Island Music Festival has pulled up anchor and moved to Oakland’s Middle Harbor Shoreline Park. This year’s lineup includes Tame Impala, A$AP Rocky, Santigold, Courtney Barnett, and more. The fest is organized by Noise Pop and Another Planet Entertainment. Tickets drop on May 18 at 10 a.m. These are the festivals you’ll need a car or some other form of magical transportation to get to. They’re still within 100 miles, so staying overnight isn’t completely necessary, but unless you love waiting in traffic you might want to consider the option. Performers include Modeselektor, Fever Ray, Tune Yards, Bleep Bloop, The Black Madonna, and more than 60 other acts. Oh, and this year there’s a lake for swimming. About 2017: California Roots Festival’s mission is to deliver “a cosmic blend of good vibes, true happiness, family, peace, love and joy to all who enter.” This year sees nearly 40 acts including Nas, Thievery Corporation, Jurassic Five, John Brown’s Body, and Yellow Man. Mutek is a multi-sensory festival bringing musical performances, art installations, audiovisual works, panel discussions, food vendors and more for “a mind-bendingly eclectic yet cohesive experience for fans,” according to a release announcing the event. “The spirit of the San Francisco underground will permeate the weekend, as the city’s potent mixture of technological innovation, intellectualism, immigration, and futurism provides a backdrop for Mutek’s programming trajectory. Oh hey, this is happening even though things got weird last year. This appears to be a “circle-the-wagons” kinda year as the line-up is considerably scaled down compared to the awesomeness of 2017. Update May 6, 2018: Oh hey, this isn’t happening.